Recently we set out on a journey of exploration, a journey focused on one key factor: Does Low and Slow BBQ Smoking Really Work? And when we say work we mean in our very own Weber BBQ Grill with Pork Ribs, natural dry rubs and copious amount of wood for smoking. Now over the past few months we’ve read just about as many books and articles as there are days in the month on smoking, we’ve seen videos, listened to podcasts and basically run the gammed on information surrounding smoking in a Weber grill. And since this was a journey of exploration we thought we’d learn a little about the meats and seasonings that we were going to use in this process. First we thought we’d talk with a local butcher to get a handle on a nice set of pork baby back ribs. The butcher gave us the ins and outs of fresh pork versus the heavy plastic film wrapped ribs you might see at your local supermarket. While both meats are virtually the same the dramatic difference is the fact that the more liquid you see in the plastic wrapped packages the more the meats telling you that it’s been flash frozen and sealed possible a hundred or more miles away then trucked and frozen again in the grocer’s storage system. The packages were then brought out and left to thaw possibly for days until some unsuspecting customer picked them up to take home. That liquid in the pack directly translates to the loss of flavor and dryness the meat results in after grilling. Remember, if the liquid is in the pack it ain’t in the meat and you can’t just automatically inject it or have it absorbed back into the meat. That liquid is gone and only some unnatural manipulations will bring moisture back into the meat. Next we thought we’d spend some time on understanding the best Smoking natural dry rubs for sale. Using Flavor Enhancers to Affect Smoking. We are aware of many products in the market natural, and of course those laden with unnatural ingredients or as we might say “flavor-enhancers”. Locating natural dry rubs for sale may not be as difficult as one thinks. Just like the majority of products at your grocers it can be relatively easy to determine the difference between natural and unnatural just by looking at the packages. Noting the differences in the ingredient statements on items like sugar, msg, chemical extracts, gluten or soy derivatives. I’ve always heard it “whatever you put in your body is what you get out”. That statement has stuck with me ever since my high school competition days. And even now we focus on natural dry rubs for sale whenever we get the opportunity. Now that we’ve got a handle on the meat and dry rubs let’s get a quick handle on the wood. We’ll assume that you’re using basic lump charcoal in a Weber grill. So, let’s discuss wood for a second. We like the richness and flavors of Red Oak woods. We’ve used peach, almond, hickory, mesquite, alder, cherry and a very subtle wood grape vine. We like Red Oak because it yields a pleasant rich oak aroma combined with a texture that doesn’t overpower the senses. The wood is perfect for beef and pork and is used religiously in some parts of the Central West. Of course if I were smoking a turkey or chicken I would consider using a mesquite, almond or alder. We will also assume that you’re going to barbecue 1 slab of baby back ribs so let’s look at two segments 4 ounces each of wood. So, let’s zero in now, we got everything we need, the grill, the meat, the natural dry rubs for sale, the wood, the charcoal, and if it didn’t mention it you will need time about 4 hours and of course a way to light the charcoal. In our journey we tried multiple combinations of woods, charcoal, cooking time, grilling with the vents open and halfway closed and just plain going for it all out with lots of wood and lots of charcoal squirreled away in on one section of the grill. We at this point were like the three bears; one was too dry, while the other was too uncooked, while finally the last one was just right. So, here’s how we did it. Our Weber grill is about 18 inches across which we purchased about 10 years ago. This grill has seen a couple hundred barbecues in that time. One thing….if you don’t know the difference between grilling and barbecue and why sometimes these terms are interchanged we’ll spell that out for you here. 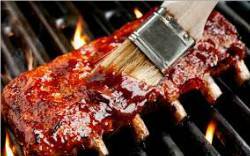 The term barbecue refers back to the Caribbean and Spanish term barbacoa referencing cooking in a low and slow method. It does not always mean using charcoal but most certainly means the food is cooked slowly for hours as in a hog is cradled between a wired source and buried underground on a bed of charcoal and hot rocks. Grilling refers to high heat cooking in the case of something you might see in a fancy steakhouse restaurant. If you were to ask for ribs in that restaurant you’ll realize that it won’t take an hour and a half to make them instead the ribs will be held at a cooling temperature then when selected, salted and peppered then placed on the grill. Some chefs might choose to put them in the oven for a few minutes followed be a last surface grill with a sauce added which is then caramelized on the grill surface with the meat plated at that point and served. Grilling allows the cook time to be cut down to mere 20 or 30 minutes as opposed to two hours. In a lot of restaurants the meat is precooked and reheated on the grill with sauce placed on just at the last minute then seared on the grill for presentation. So, we are focused on barbecue. Let’s understand this will take three and a half to 4 hours. We decided to layout our charcoal to create an almost three quarter circle around the grill. The charcoal was one layer of two rows side by side with one layer of charcoal on top of the rows. We then laid two sections four ounces each of red oak wood on top of the charcoal about eight inches from the front starter row of charcoal and the second segment about midway of the circular row of charcoal. To get the party started we took about 10 charcoal briquettes and placed them in a fire starting chimney. We used standard newspaper under the chimney. At the very bottom of the chimney we sat it on aluminum foil which was sitting atop concrete. We lit the fire and waited about 15 minutes until the charcoals had a reasonable ash on them. We used long tongs to place the charcoals one by one at the head of the starter briquettes in the same fashion side by side with a briquette on top. By doing this step it would allow the temperature to regulate faster and would slowly start the next connecting charcoal briquette as the forward most briquettes started to burn out thus continuing the burn cycle all the way through the cooking process. Our key temperature was somewhere around 225 degrees. We say “key” because try as we may it was near impossible to manage the temperature to that level. We saw readings of 200, then 240, then 235, then 250 and so we notched down the top vents of the grill to restrict the air flow and thus adjust the temperature. The bottom vents were wide open to receive as must air as necessary and not starve the charcoal. When the wood came into play the burning drove the temperature up about 15 degrees somewhere around 250 degrees. No matter how many times I slow smoked ribs I always received the same results with an increase of about 15 degrees from wood. One other thing, I managed the temperatures with a remote digital temperature probe. The probe allowed me to be within 100 feet of the grill and still receive accurate readings. So, now I’ve seasoned the meat using the natural dry rubs for sale we purchased. I’ve got my fire ready and the temperature has been running a reasonable 220 to 245 degrees. I will tell you that I added a small aluminum pan filled with water. The pan allowed me to create a little steam in the grill which would help in adding moisture to the meat. Also in the slow smoking barbecue process the meat is never placed directly over the fire. The meat is always kept away from the fire and the vent on the lid is placed over the meat which will allow the smoke to draw over the meat thus aiding in the smoke layer. Once the lid is on we simply watched the temperatures. We did not lift the lid unless the temperature got unreasonably high. The only thing we did was adjust the top vents on the grill then check back about 5 minutes after to see the results of the change. We adjusted the vent about 10 times during the course of the smoking cycle. Now as we said our targeted cooking time is about three and a half hours. That time is dependent on the thickness of the baby back ribs you purchase. If thinner in size then three hours will do. After the three hour time confirm the temperature on your remote readout or slowly remove the lid allowing the smoke to exit away from you then take a temperature probe and insert that between the bones of the meat to confirm. Some say at this point you can remove, let rest for about 10 minutes then serve. Others want to add back some moisture by wrapping the ribs in foil then adding liquid like apple juice, brown sugar and honey in the foil, followed by placing the ribs back on the grill for another hour or so. I’ve done it both ways and placing them back on does add moisture and flavor. However, if you’ve reached the eating hour forego the foil process and simply slice the ribs and serve. The results were fantastic. Slow smoking allows wood smoke to penetrate the surface of the meat. It’s one of the few ways that you can directly change the taste of the meat to match your preferred desires. I recommend a journey of your own exploration but follow the steps in our post to help cut out on the actions you may not want or need. There are many ways to cook ribs. We hope that this post helps you understand how we demystified the process of slow smoking in a Weber grill. Our biggest aids were time, charcoal, a great natural dry rub for sale and of course a decent cut of meat. Visit www.jakesfamousfoods.com to buy natural dry rubs for sale online. Planning a large party? Or do you own a restaurant or catering company you too can shop our Bulk Products and order online? You can also shop our individually sized dry rubs and condiments for your special BBQ as well as get your hands on some mouth-watering special BBQ recipes. Get them today. ¼ Cup Jake’s Really Good Mild BBQ Sauce. 2/3 Cup Jake's Ball Park Ketchup. 3. Add remaining ingredients into the sauce pan; reduce heat to low and cook until mixture thickens about 45 minutes or so stirring frequently.